Emilio my little son was invited to a playdate, I don’t usually take something to playdates, but this one was with his best friends, so I thought to bake something and this cake has the wow factor, it is a flan and chocolate cake together, it is quite popular in Mexico, some people call it, “Pastel Imposible” (imposible cake), but my little boy calls it magic cake, so this is the way we call it. It is not difficult to make and the result is divine! Imagine having flan and chocolate in one cake!! 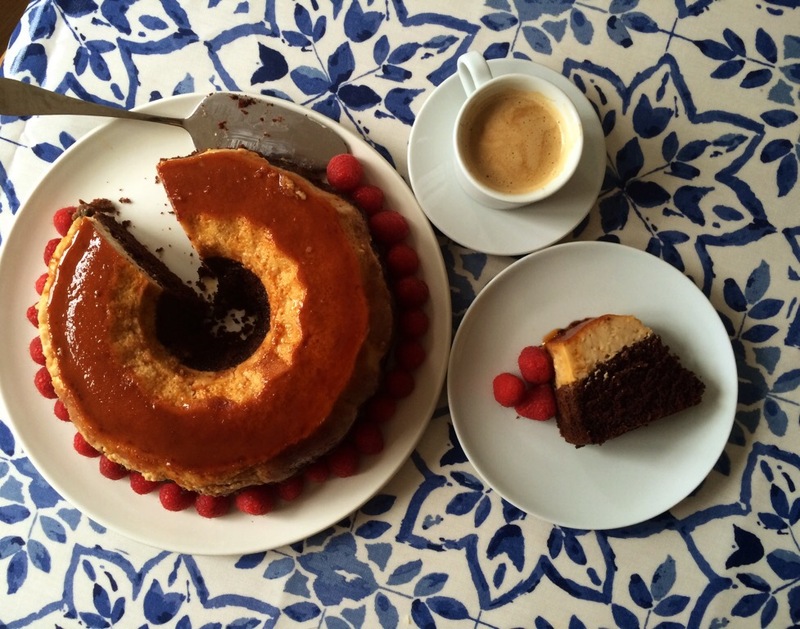 Yes, I know, it is ridiculously delicious and believe me, it works, the chocolate mix goes up and the flan, because is heavier, goes down, so it looks like you did a bit of magic. There are two ways of doing the cake, the quick way: using a chocolate cake mix from Betty Crocker or the proper way, doing everything from scratch. Coat the bundt pan with some butter, before pouring the caramel. Place the caster sugar in a saucepan and melt on medium heat until the sugar becomes caramel (I never stir, I just let the suggar dissolved). Pour the caramel onto the bundt pan and leave aside. Mix all the flan ingredients in a blender. Evaporated milk, condensed milk, eggs and vanilla extract. For the easy option, mix the cake mix according to the box instructions. For the proper option, add the butter and sugar to a bowl and using an electric hand mixer or stand mixer, beat until light and fluffy, then beat in the egg. Sift together the flour, baking powder, baking soda and cocoa in a medium bowl. Mix all the ingredients in a large bowl. Pour the cake mix into the bundt pan first and then the flan mix. Seal it with aluminium foil. Place the pan into a roasting tray and pour hot water around the bundt pan half way. Bake for around 1 hour, until the surface of the cake is firm to the touch, or insert a toothpick if it comes out clean is done. When cake is done, remove from the water bath and cool completely to room temperature, about 1 hour. Invert a large, rimmed serving platter over the bundt pan, grasp tightly together, jiggle a little and flip over. Leave to rest for another hour in the fridge and serve.